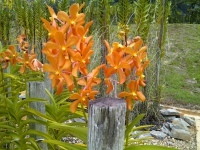 The DBKU Orchid Park was constructed in November 2007 on an area that covers 35.4 acres. It was opened to public on 5th May 2009. The original concept of creating an orchid Park in the heart of Kuching City materialized as part of our vision to have a Park in the city and also green lung zone, where we hope to encourage the public towards caring for the environment and be more appreciative towards our flora and fauna. The Park serves as a major tourist attraction offering both horticultural and botanical interest. 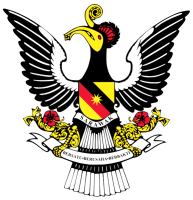 The Park is developed and managed by Dewan Bandaraya Kuching Utara (DBKU). Admission to the Park is free. The Park is open to public every day except Monday from 9:30am to 6pm. The Orchid Park is divided into two major areas, made up of the nursery and the display area which houses a collection of over 75,000 orchid plants comprising of 82 genera. The display area shows the rich and exquisite variety of orchid species and hybrids consisting of epiphytic and terrestrial type planted in the open, shaded and semi-shaded areas. What makes the Orchid Park special is the collection of Borneo Orchids such as the Lady’s Slipper (Paphiopedilum sanderianum) which is endemic to Sarawak, Coelogyne pandurata, a unique and rare green and black flowered orchid. The infamous Orchid Normah (Phalaenopsis bellina) which was declared the state flower of Sarawak, is also found at the Park, and commonly used to produce many colourful star-shaped novelty hybrids. The uniqueness of DBKU Orchid Park is reflected in the way the orchids are planted, integrating the natural landscape of hills with man-made features such as gazebo, bridges and water-features into a harmonious and aesthetically exceptional display. At the Park we try to imitate the setting of the jungle as close to its original setup as possible for orchids adapt and respond better to surroundings that resemble their natural habitat. Orchid Park receives regular visits from schools around Kuching. Guided tour around the Park and demonstration on taking care of orchids are given during those visits.